Winter is coming, and just as we prepare ourselves to face the cold weather, we should make sure our animal companions are safe and warm for the whole season. What do you need to do? According to the American Veterinary Medical Association, you should take your dog in for a checkup before the season starts. The AVMA says the cold may aggravate conditions such as arthritis. You’ll also have a chance to ask your vet about any precautions you should take in cold weather. When it’s time to go out, keep in mind that when it comes to doing well in the cold varies from animal to animal. Know your pet, and behave accordingly, the AVMA says. You can always go for that long walk with friends or family. Dogs with long or thick coats, the AVMA says, tend to be more resistant to cold weather, but you still need to keep their safety and endurance in mind. The ASPCA recommends trimming your long-haired dog’s coat just a little to avoid ice balls, de-icing chemicals and salt crystals clinging to his coat. Never shave your dog’s coat entirely. Before your walk, the ASPCA says, try massaging your pooch’s paw pads with petroleum jelly to guard against de-icing chemicals and salt. After your walk, the ASPCA says, dry your dog’s feet and stomach to further minimize the chance of coming in contact with dangerous substances. It’s also a good idea to check between your pet’s toes. If you want your keep your dog comfortable with a sweater, make sure you have more than one so you won’t be taking out your furry friend with a sweater that hasn’t dried from an earlier walk. Some dog owners like booties; the AVMA says just make sure they fit properly. Additionally, keep your dog’s age and health in mind: Elderly pets, just like elderly people, can slip and be injured. 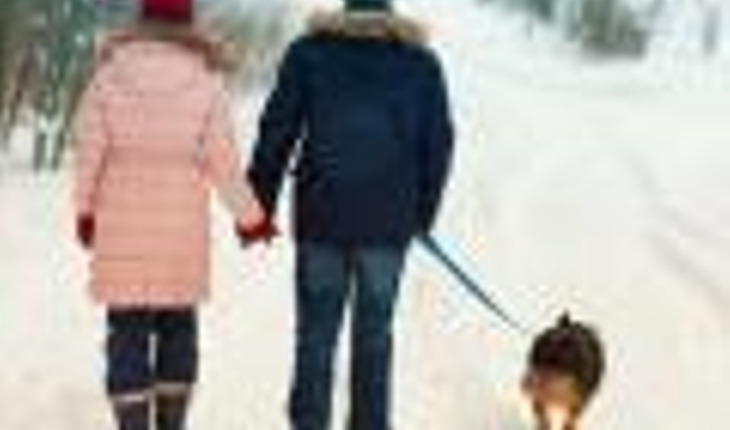 If you have a senior pet, aim to walk on cleared paths rather than on ice or snow. According to the AVMA, dogs with conditions such as diabetes, heart disease or kidney disease may have troublesome fluctuations in body temperature. The AVMA emphasizes that if your pet seems weak, moves more slowly, and starts whining or shaking, take them inside immediately – the may have hypothermia. If you think your pet has frostbite (which may not be detected until a few days later) or hypothermia, go to a veterinarian immediately. Never let your dog or cat outside unattended in cold weather. They are as much at risk as humans for frostbite and hypothermia. And leaving a pet in an unheated car can be just as dangerous as leaving him or her in a car during hot weather. For more cold-weather safety tips for pets, visit the American Veterinary Medical Association’s website and the ASPCA’s site.